Wrestling can be both competitive and entertaining. Which type do you prefer? Both types are quite engaging and can be intense at times, so no wonder there are so many fans of this sport all around the world. The news on the subject, however, may be hard to follow. 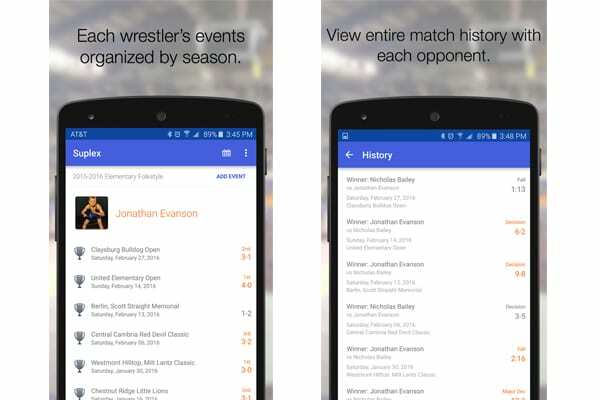 Luckily, there are some apps that can help you keep track of all the events connected with wrestling. Below, we name the best sources! Wrestling-Online.com is one of the most popular information sources to get recent news from the wrestling world. It has been out there since 1998 and still continues to produce high-quality content. The app represents a mobile-friendly version of the website. It has special categories of news, such as WWE, Impact Wrestling, NJPW, articles, latest news, etc. The articles that you read in the app can be opened in a browser or shared through social media, messengers, or any other apps you have. You can save the most interesting materials to the favorites to check them out later. The ‘favorite’ button is situated at the end of the read. You can also turn on notifications to get the freshest facts the moment they are out. In sum, this is a very nice and simple app to keep track of what’s going on wrestling arenas all around the world. The only drawback is advertising that apparently cannot be removed. However, because of that, the app is free. Get it now and enjoy! WWE is a world-famous company, the abbreviation of which stands for World Wrestling Entertainment. So, it is kind of obvious that the app introduced below is more of an entertainment app that lets you follow all the glamorous news, the careers of superstars, reality shows and other content like that. There are live shows as well! If you want to get a full access to this feature though, it is necessary to go premium. The company is not just about wrestling anymore. At the moment it also produces clothes, movies, music, computer games. Why? Well, because it is able to afford it! If you are into wrestling, you’ve probably watched one of their programmes anyway, so you have an idea what it is all about. So, now you know that they have an app as well. Recommended for all the fans of watching wrestling for entertainment! 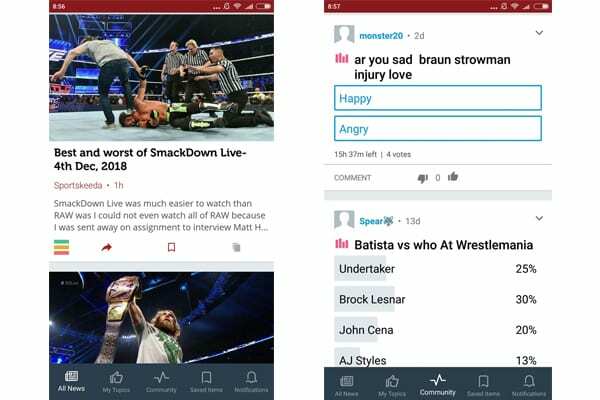 If you don’t want to have an enormous cumbersome WWE app on your phone, you may try an alternative which is an unofficial WWE News app created by Sportfusion. 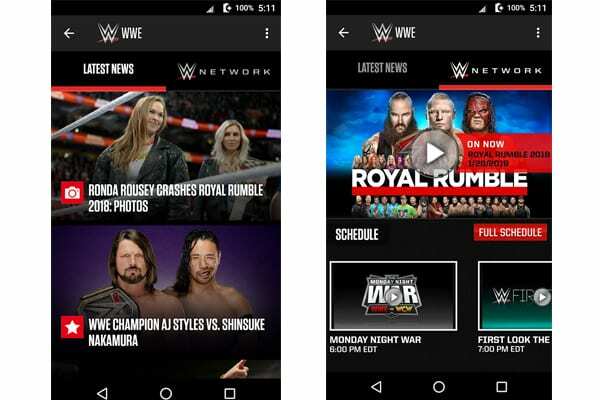 The app embraces all of the WWE pieces of news and lets you choose which ones interest you most. According to your preferences, you may follow this or that sportsman, different kinds of events, and other special materials. There is also a possibility to become a member of the app’s community. You should certainly try it because it gives you an opportunity to discuss your favorite topics with like-minded people and share opinions on various subjects that may be difficult to converse on in a real life (Well, okay, let’s be honest – WWE conversations are not the most difficult in life). What I like most about this app is that all the news is divided into there categories – newest, major, and discussed. It lets you choose what you’d enjoy reading most. The app certainly deserves a download! Now let’s get local! Watching other wrestlers may inspire you, but what is more inspiring is your own successes and failures. This app might not fit into the category ‘wrestling news’, but it is definitely useful for all the fresh wrestlers out there whose careers have just begun. So if you are a wrestler or a wrestling coach or have a son or a daughter who is attending a wrestling school, then this piece of information is for you. Suplex is a wrestling journal that allows you to keep track of all the events that you are going to participate in, all the events that happened in the past, your scores in those events, and history of how it has gone with each of your opponents. For convenience, all the events are divided into seasons, and, by the way, you can view your performance in each season and draw conclusions on how successful you were. The app is an excellent substitute for a pen and paper method or those tiring computer spreadsheets that some coaches are trying to use. If you want to access an easier way of organizing all of the information about your wrestling experience, then you should definitely try this app! Download it now to learn of other features that might come in handy. All Wrestling News (Android) or Pro Wrestling News App (iOS) are different names of the same All Wrestling app designed by CM3 Solutions. The app is not that complicated at all. In fact, for some, it may seem too simple. Even the settings menu is absent! 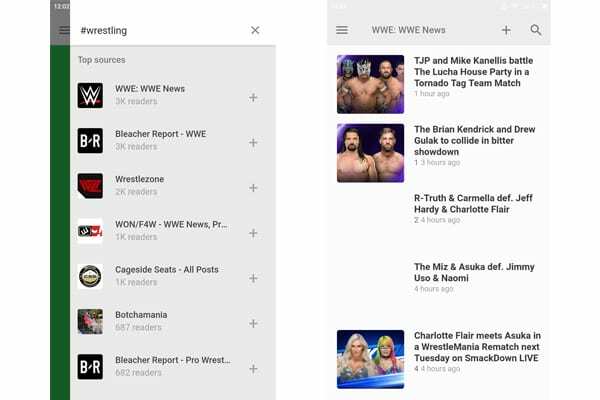 However, the biggest advantage of this app is that it provides you with different kinds of news on wrestling topic, including WWE results and rumors, TNA Impact Wrestling, Lucha, New Japan, ROH. You can also view blogs and open links to allwrestling.com and its podcasts. Reading articles using this app could have been much more pleasant if the developers paid a closer attention to how it all looks like for the eyes. It is alright and it is simple, but given the fact that nowadays a one can find lots of different apps and sources connected with anything, the app just loses in its competitiveness. You can try it though! It may look old-fashioned, but it does the job anyways. Wrestling News World is an app that, first of all, covers different kinds of wrestling news – not just WWE, but also New Japan, TNA, Ring of Honor. Secondly, the app is created and supported by WWE insiders and therefore you can get an access to the most up-to-date information from the wrestling world. Besides, they are streaming live results that can sometimes get to you even faster than it is shown on WWE. Live discussions are also there, so don’t forget to turn this app on as soon as the battle begins. What is also remarkable of the app is weekly quizzes. This light form of entertainment is quite enjoyable. Upon the whole, the app is a good one. However, it has certain drawbacks. Advertising that can be intrusive at times and slowness attributable to the app even if you have a good internet connection are the main ones. So, if getting an insider information inspirits you, then tap on one of those buttons below to download the app! ESPN or entertainment and sports programming network is an American sports channel that you are probably aware of. Well, if you are not, now you are – there is such a channel. ESPN can guide you through the news connected with lots of different kinds of sports – from NBA to chess. Wrestling or, in particular, WWE is one of them. Here, you won’t see updates on the topic too often as it is usually the case with other apps, however, the overviews of events come in great quality. So if you value quality over quantity, you should at least consider downloading this app. ESPN also provides you with streams and live scores. You can watch videos, listen to podcasts, or just read. If you are not just into wrestling, you can follow lots of different sports and get notifications on each of them. The app looks really nice and it is easy to use. 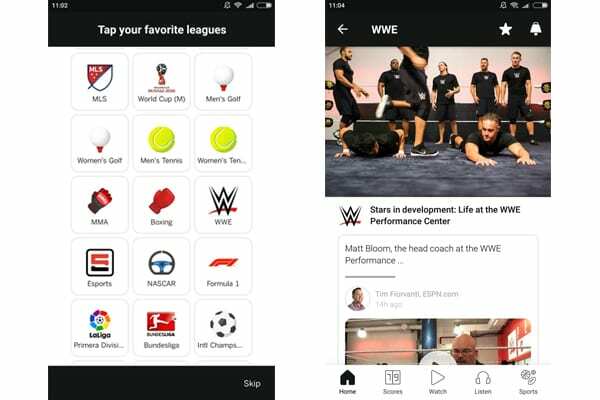 So, if you are only into wrestling then choose a more specialized app, but if you can read a piece or two of other sports news, this one will most certainly satisfy your needs! Did you know that you actually don’t need a special wrestling news app? (Why has this article been written then) Well, at least, it is not necessary to have such an app if your aim is to get fresh articles on WWE or on any other topic for that matter. Feedly is an app that helps you gather together all the news that you are interested in. The app works in a tricky way. First, you choose hashtags and sources you’d like to follow. After that, the app creates a personalized feed for you so that you could receive only the news that you care about. So, in our case, it is all about wrestling. With Feedly, it is easy, quick and enjoyable to read news on any subject. WWE shouldn’t be an exception. Plus, you can choose other themes you find fascinating or enter some more particular hashtags like, for example, names of your favorite wrestlers. You can even add all the sources we’ve discussed earlier to your feed. As we see, one can pretty much do without a special wrestling news app. Get Feedly now and enjoy your daily newsletters! The app somehow reminds of Feedly. It is also green and the news is presented in a clear manner. Probably when it comes to wrestling, eWrestling News is even more convenient than Feedly. First of all, it has more special features; secondly, you won’t need to choose sources manually and, thirdly, there is a great handy menu that includes four categories: news, breaking (news), videos, and results. So, depending on your interests at the moment, you can choose any category you need to learn the necessary information. The app is truly amazing – it is worth not just downloading and trying out but keeping as well. Even the ads are not that annoying. It is a pity there is no iOS version of the app. 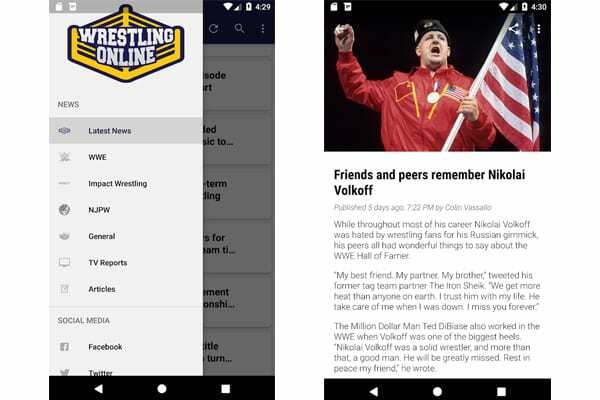 One more wrestling news app for Android. This one is an RSS reader for most of the famous wrestling websites. Among them are such sources as Lords of Pain, Wrestling Inc, Wrestling News Online, ProWrestling.net, and others. The app offers you a brief summary of the news, comments, some other materials, and if you are interested in what you see, you may tap on the button ‘full text’ to open the source and read everything or view a video, for example. RSS way of introducing information is quite handy if you think about it. If you ever used Twitter, you can imagine how it functions. I’ve made screenshots of a night mode of the app, however there is a lighter version as well – this one just looks more stylish. As for other details, there is not much to them. There is a ‘share’ button in the corner and that’s basically it. Apparently, the app hasn’t been updated for a long time – it has been 3 years since the last update. Because of that, some websites on the menu are failing at opening up, which means that it is whether they stopped working or changed their web adresses. Some still work though! And this is exactly why this app is worth putting on our list. If you are an Android user, you might give it a try. Sometimes simplicity wins over loads of unnecessary buttons and advertising. Maybe this will be the case for you! To wrap up, in this article we’ve discussed 10 best apps for getting and following wrestling news! Stay tuned for new materials on our website and, as always, be smart in choosing apps!